Shanghai Xiao Long Pao is a restaurant found on the 3rd floor at MBK Center in Bangkok. We first ate here when it was called Shanghai Happiness. Originally we thought the food was excellent but in December 2012 we ate there after the name change and were disappointed. In December 2013 we tried it again and were pleased. 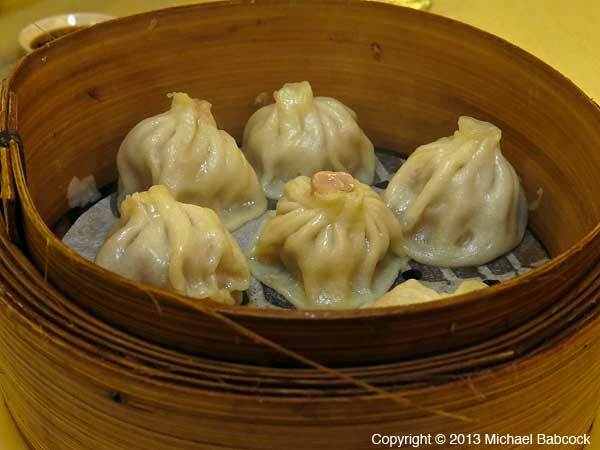 Here’s our previous blog on the restaurant: Shanghai Dumplings in Thailand. 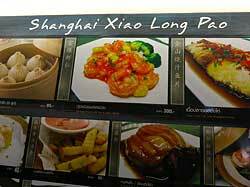 Naturally, our main reason for eating here is to get the Shanghai Dumplings – Xiao Long Pao. We were pleasantly surprised by the dumplings this visit. Although I would not put them in the transcendental category, they were quite good. The dough was not too thick, reasonably pleasant looking in appearance and acceptable tasting (if just a bit soggy). The filling itself was quite flavorful. There was some broth that squirted out when we bit into the dumpling, though I would have liked a bit more; one of the dumplings was broken so had no broth at all – it should not have been served. I thought the accompanying dipping sauce, a flavorful combination including black vinegar and chopped ginger, was excellent. All in all, a good Xiao Long Pao – I’d give it 7 on a scale of 1 to 10. When we first went in May 2011 (see previous blog), the dumplings were excellent. 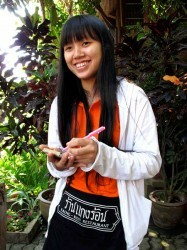 In December 2012, not very good at all. This time, in December 2013, they were again pretty good. I give a caveat that the quality here seems to vary; hope that you get here on a good day! I was sorry to see that some of our old favorites were: no longer on the menu, particularly the Pan Fried Ham and Onion Cake, which was quite good. We very nearly always get a pork belly dish here. 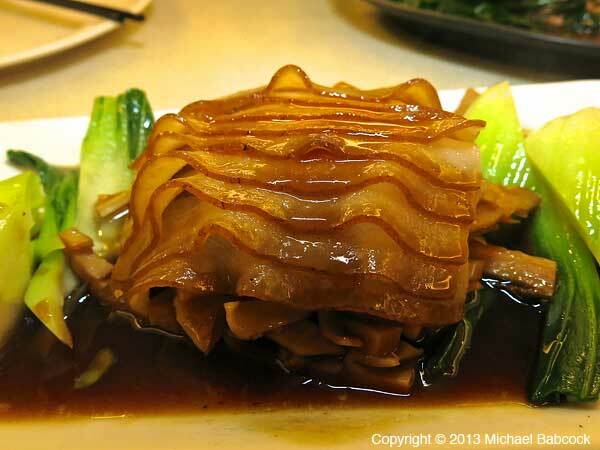 This time we got Braised Pork and Bamboo Shoots with Brown Sauce (shown above left). The pork belly is sliced thin (a bit too thin, I think) but it’s all there, including the (yummy) fatty portions. 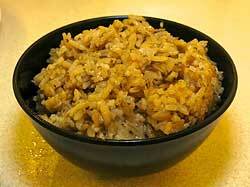 The sauce is tasty and the bamboo shoots are a nice complement. 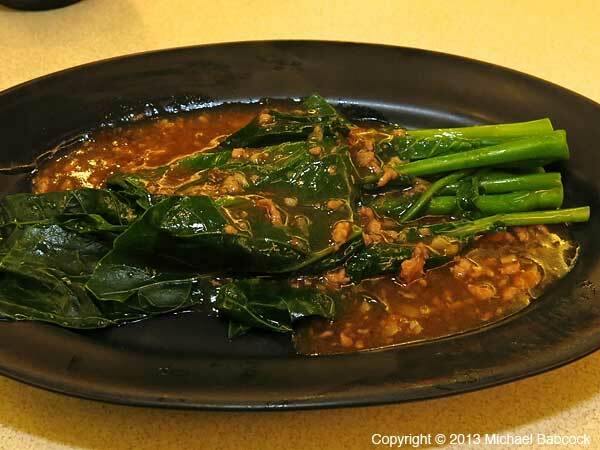 Kasma was hungry for vegetables so we got the Chinese Kale with Spicy Minced Pork Sauce (shown above right). 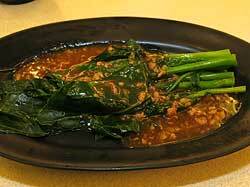 This may have been my favorite dish: the sauce was very flavorful and just a bit spicy. Alas, with just two of us eating, we were unable to order too many dishes. 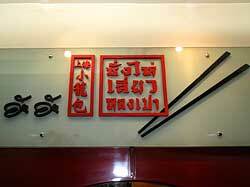 In addition to the 3 above, we ordered a bowl of “Chinese Seaweed Rice” (above left). This is the rice they serve with their “Chicken Rice.” It’s made a bit like a risotto, with plenty of delicious, healthy chicken fat. It’s very good. We finished up with a dessert, Taro Balls in Coconut Milk (Bua Loi Peuak). A nice, not-too-sweet way to end the meal. All in all, I hope to eat here again. I’d like to confirm that the Shanghai Dumplings remain good and try a few other dishes on the menu to see how good they are. I would give the restaurant a qualified recommendation at this point, pending further visits. Look for these two signs on the outside of the restaurant. Also, check out our previous blog for more pictures of the outside as well as some of the inside, which remains unchanged since that original blog. 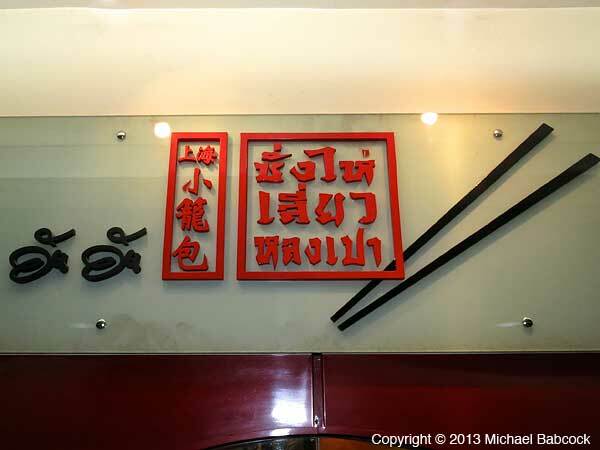 All of this blog pertains to the Shanghai Xiao Long Pao restaurant at MBK Center at 444 Phayathai Rd., Patumwan, Bangkok. 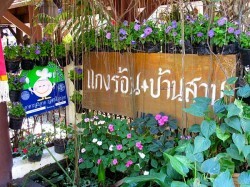 MBK is pretty easy to get to since it’s within walking distance of the National Stadium skytrain station. The restaurant is found on the third floor in the Tokyu zone. 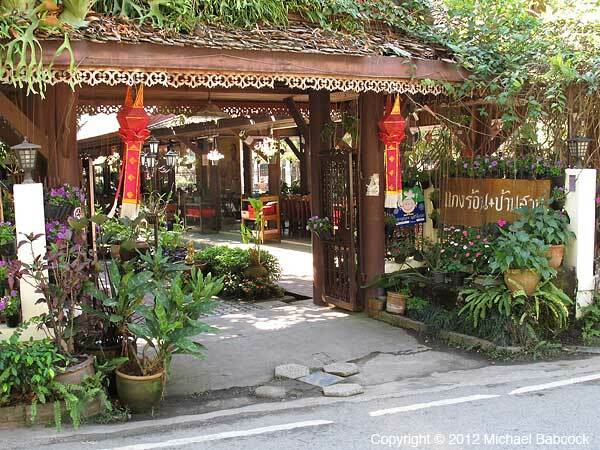 Perhaps my favorite restaurant in Chiang Mai is ร้านอาหารแกงร้อนบ้านสวน – Raan Ahaan Kaeng Ron Baan Suan – meaning, literally, “hot curry garden house restaurant;” it’s usually referred to as Kaeng Ron Baan Suan. 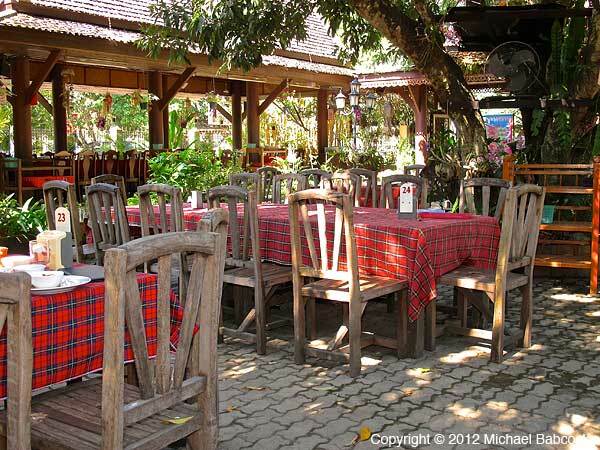 According to their website, it features “Delectable Northern and Thai Cuisine in a Traditional Lanna Garden” and the food is very delectable indeed! They have a number of Northern specialties that make it well worth a visit. 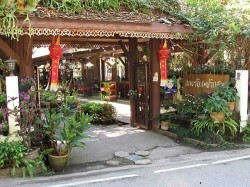 To the upper left is a photo of the entry into the restaurant. 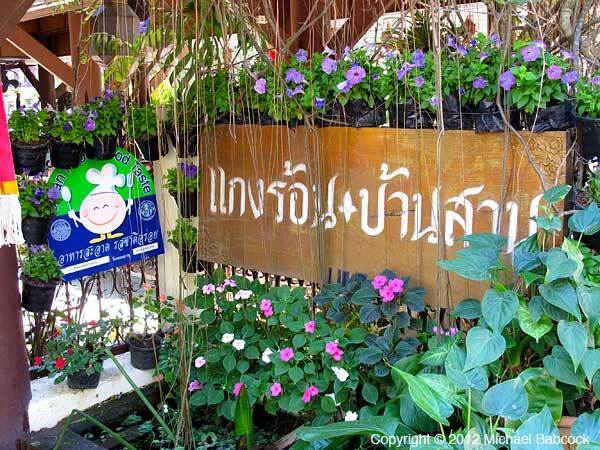 The picture on the right shows the restaurant sign – แกงร้อนบ้านสวน (Kaeng Ron Baan Suan). 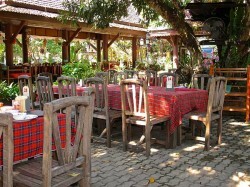 You can find the restaurant location below. The seating area is, indeed, in a nice garden setting (shown to the left). 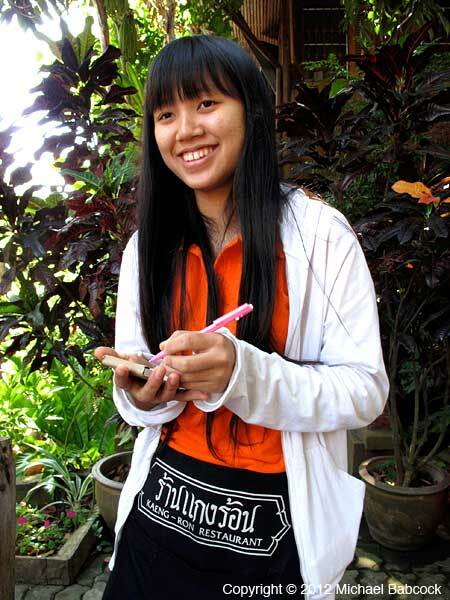 To the right is our server on one of Kasma’s recent small group trips to Thailand; Kasma takes two of her trips here for a lunch-time feast with some of the delectable northern dishes that the restaurant is known for. 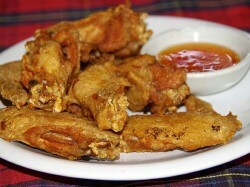 If you’d like, you can go directly to a slideshow of some of our favorite dishes at the bottom of the page. Of course, the main reason for coming here is the food, which is spectacular. 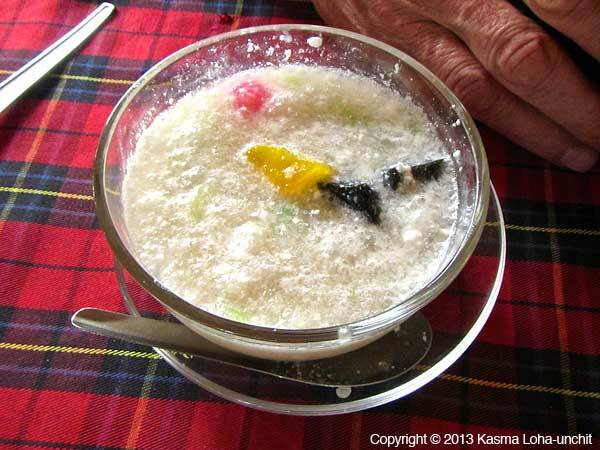 Kasma always begins with at least one of the two dishes above. 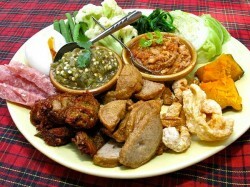 At the upper left is a platter with various vegetables, meats and pork skin that will be eaten with the sauces on the platter. 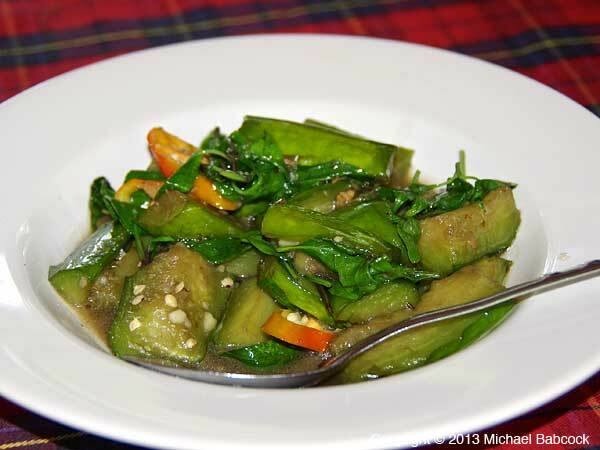 The right-most sauce in Nam Prik Nuum – a very spicy, young green chilli sauce. 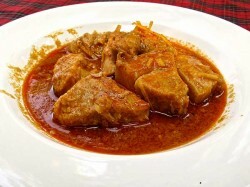 The left sauce is Nam Prik Ong – a pork-based sauce. 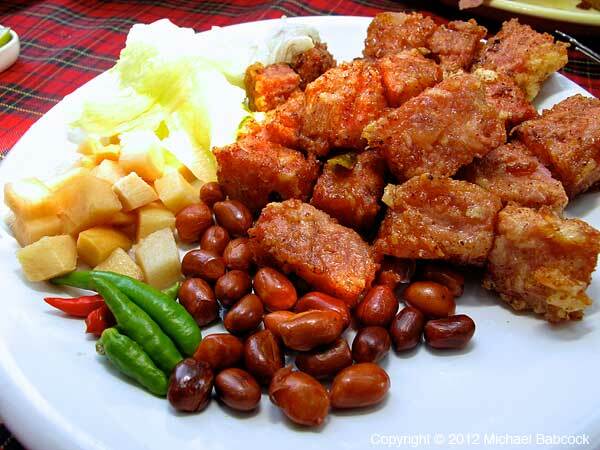 Kasma also finds it hard to pass up the dish on the upper right – Fried Naem Sour Sausage Slices (Naem Tod). To eat this dish, you pop a piece of the fried sour sausage into your mouth along with some or all of the accompanying items of your choice: fried peanuts, ginger, a bite of Thai chillie (hot!) and/or some cabbage. Naem is something you really should try when in Northern Thailand. 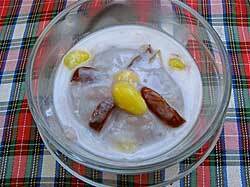 Check out Kasma’s blog Don’t Miss Naem Sour Sausage When Visiting Northern Thailand. 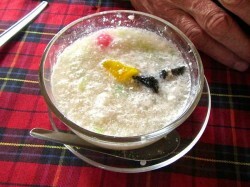 Naem is often served “raw” (it is a fermented product) so Kasma prefers to order it in this form where it is cooked from the deep-frying. The dish on the left is another “must-order” dish (there are so many here!) – one of my top ten favorite Thai dishes: It is Northern Hunglay Pork Curry (Kaeng Hunglay), a flavorful pork curry made with rich, fatty pork – so delicious. 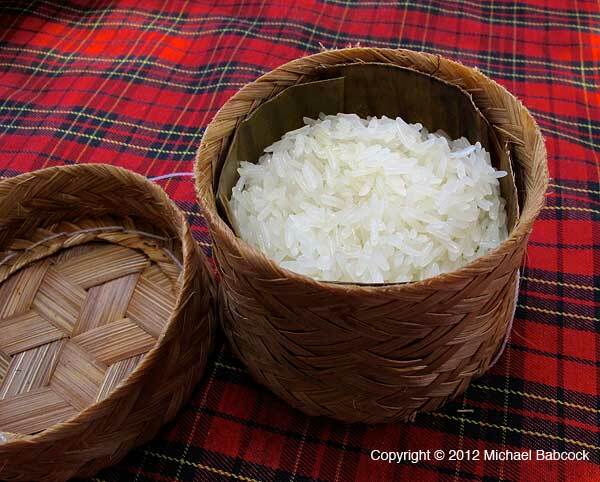 At this meal, Kasma always orders sticky rice served in a traditional fashion: each person (or pair) gets an individual basket with the sticky rice, which is eaten with the fingers. Two other favorites above. The first dish is “Garden House” Crispy Fried Chicken (Gai Tod Baan Suan) – their own particularly delicious version of fried chicken. The other dish is, of course, Green Papaya Salad (Som Tam). Two more great dishes. 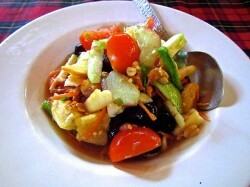 On the upper left is another of my current top ten Thai dishes: Thai-Style Hot-and-Sour Mixed Fruit Salad (Tam Ponlamai). 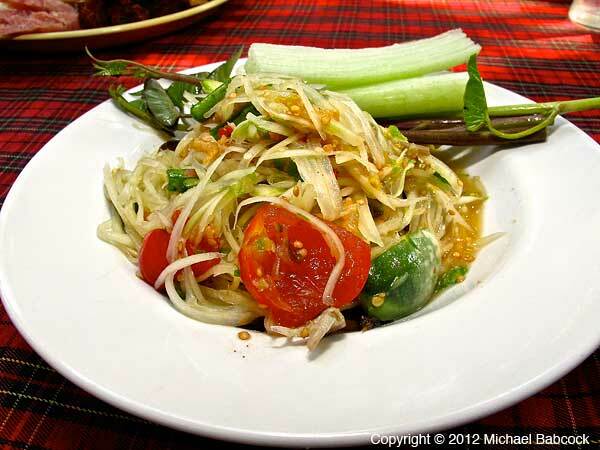 I first had this scrumptious salad here at Kaeng Ron Baan Suan. It looks like a fairly innocuous fruit salad but nothing can really prepare you for the combination of sour/hot-spicy (from chillies)/garlicky explosion of flavors in your mouth: in combination with the fruit it is extraordinary. The second dish, especially tasty here, is often found as a street food: Charcoal-Grilled Catfish, “Sweet Fish Sauce” and Neem Leaves (Sadao Nam Pla Wan Pla Doog Yang). 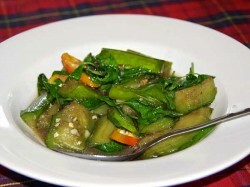 The neem leaves have an extremely bitter taste by themselves; however, in combination with the succulent grilled catfish and the sweet dipping sauce they add an exciting taste and texture to the dish. 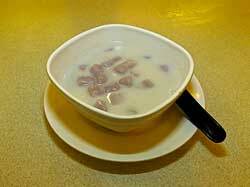 I don’t know of anything quite like this in western cuisine. Two more dishes that Kasma orders here. 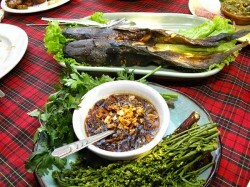 To the upper right is Long Eggplant Stir-fried with Holy Basil (Makeua Yao Pad Kaprao). 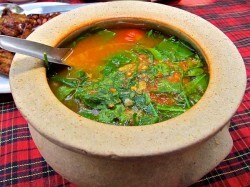 On the right is Northern Spicy Curry with Vegetables (Kaeng Awm). I usually get a blended fruit drink to accompany my meal; they are essentially fresh fruit blended with a little ice to make a fruit smoothie. 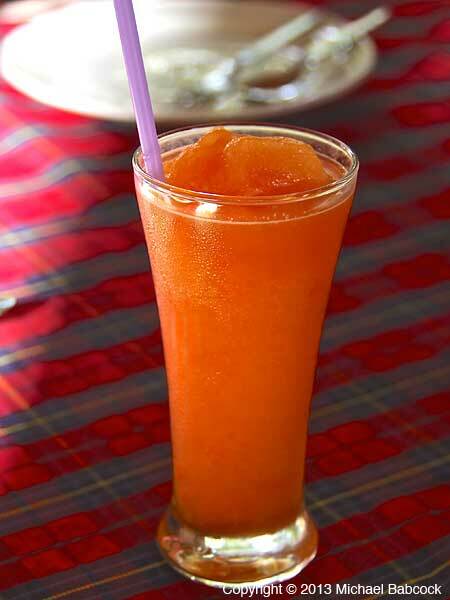 This type of drink is called pan, which is pronounced with a “bp” at the front, so more like “bpan.” They are a very refreshing drink to go with all the flavorful and (often) spicy dishes. 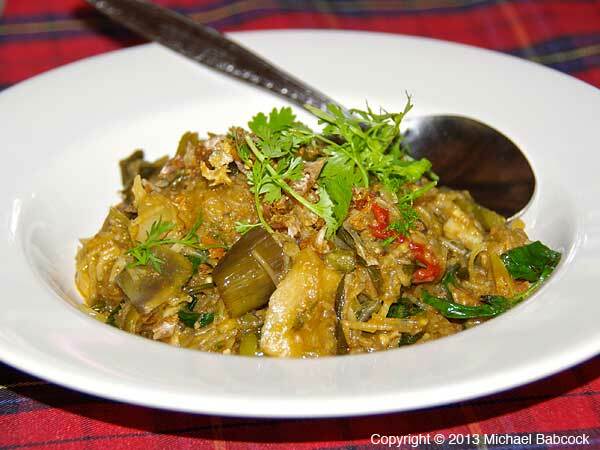 Assuming you have room left after such a scrumptious feast, there are a number of Thai kanom to try, which will refresh your mouth after the spicy food. 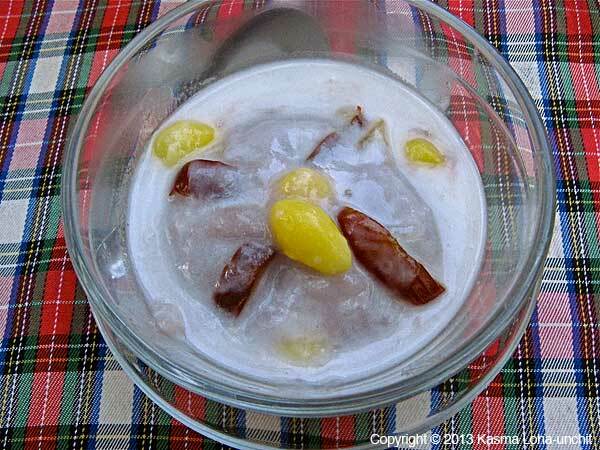 Kaeng Ron Baan Suan Website (in Thai only). 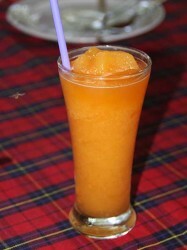 Map to Kaeng Ron Baan Suan. Here’s another review of Kaeng Ron Ban Suan. You are currently browsing the Thai Food and Travel Blog blog archives for January, 2014.